The Fotodiox OM to Nex adapter is bigger than the OM Zuiko 21mm f3.5 lens. absolutely tiny. It is about the same size as the Fotodiox OM to NEX adapter. Most other camera systems would call this a pancake lens – it’s not, it’s just that most modern DSLR cameras are very bloated and unnecessarily large. Optically it has 7 elements in 7 groups, is 31mm (1.2 inches) long, 59mm (2.3 inches) in diameter and has a filter thread of 49mm. Like most Olympus OM lenses there are different versions of the lens – the original weighed in 185g (6.5 oz) while the newer MC (multi coated) one, which is tested here, is 180g (6.3 oz) while sharing the same optical construction and exterior dimensions. Although it does not have the floating rear element of the f2 version it still focuses down to 20cm (7.87 inches) and the quality is reasonable. 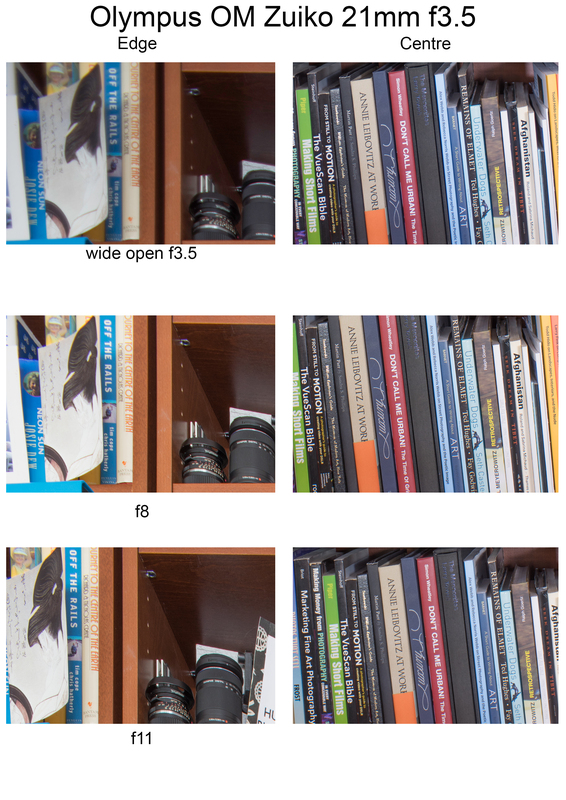 The book shelf optical test. The camera is mounted on a tripod so as to get the whole shelf in the frame without causing loss of the parallel vertical lines. 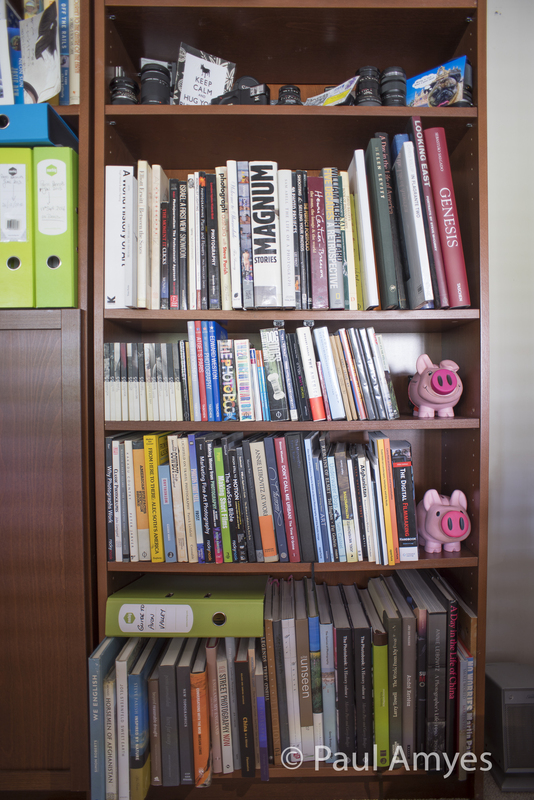 Using my standard book shelf test it is immediately apparent that the lens has noticeable barrel distortion. This is not uncommon in wide-angle lenses and occurs where the image magnification decreases with distance from the optical axis and makes parallel straight lines look like the edges of a wooden barrel. These days this can be easily corrected in post. Looking more closely it is easy to see chromatic aberration on high contrast edges, again easily corrected in post. Wide open at f3.5 the centre of the image is sharp with what would now be construed as having low contrast but is actually quite good and can easily be improved on with a quick adjustment in curves. The edges are very soft and lacking in contrast – not mush but would be easily noticeable in architectural shots. At f8 the centre has improved and you can forget the thoughts of a contrast adjustment. The edges have improved but they are still not good. It is at f11 where things start to come very good, the centre is excellent and the edges are not far off. Any further stopping down and optical quality will drop off due to the effects of diffraction. Vignetting is very apparent when wide open – maybe 2 to 2 1/2 stops difference between the centre and the corners. Things improve significantly by f8. Flare is very well controlled considering the angle of view and the sun stars are quite nice considering there are only six aperture blades. All images are SOOC with no sharpening or optical corrections. The sections are 100% views from the centre and top left corner of the image. This can be viewed larger by clicking on the image. Wide open vignetting causes a light loss of 2-21/2 stops in the corners. A comparison between the Olympus OM Zuiko 21mm f3.5 and the Canon EF 20mm f2.8. So keeping in mind this is a sample of just 1 and I have no idea if this is a good example or a bad what can I say about this lens. Well I happen to own a Canon EF 20mm f2.8 and while not one of Canon’s primo L lenses it is considered quite a respectable performer when stopped down. When we compare the two the first thing that comes to mind is the size difference. As I said before the Olympus is tiny, and it still looks small when attached to the lens adapter. Vignetting on the Canon is very well controlled, this is the big benefit of that large front element (72mm filter size compared with 49mm). Chromatic aberration is no better and no worse. It is the wide open corner sharpness where the Canon beats the little Olympus, but not hugely so and by f5.6 they are both pretty much the same. The big advantage the Olympus has over the Canon is filter use – the smaller size makes filters more affordable and I would hazard that is one of the few, if not only, ultra wide-angle lens that safely use the Cokin P system (84mm in width). My Canon still vignettes with the larger Cokin Z-Pro system (100mm in width). Stopping the lens down to f16 and then using the closest focusing distance of 0.2m I was able to capture a wide-angle close up of these flowers with plenty of DOF. Everlastings on Mount Brown in York, WA. This lens encourages you to look for unusual points of view. A Vampire jet on the Beverley-York Road advertises the Beverley Aeronautical Museum. The OM 21mm f3.5 is well suited to architectural photography. The York Residency Museum. Built in the 1850’s as the quarters for the superintendent of the York Convict Depot and is the last remaining building from the depot. Later it became the official residence of the magistrate, then it was used as part of the old York Hospital. It fell into disrepair and was saved by the work of the York Society. In 1972 it opened as a museum and has been used as such since. Shooting into the sun flare is very well controlled for such a wide lens. Note the sun star – the six aperture blades create a nice effect when stopped down to f16. The Shire of York Christmas tree for 2016 on Avon Terrace. Well my only criticism of this lens is really nit-picking. It is just that aperture of f3.5 is a little dim and if I were to use it on an SLR (digital or analogue) it would make focusing using a split screen finder a little bit tricky. With the EVF of the A7r it makes no difference as the view can be made brighter and the focus peaking is easy to see. Probably this is not the lens to buy if you’re into astro, but if you shoot landscape and architecture as I do then it is a worthy addition to the camera bag.